Stapelias are perennial succulents. It usually makes a bunch of erect, succulent stems of green to reddish, depending on exposure to the sun. The plant in this picture is Steplia Gigantea grown outdoor. Stapelias are usually known for star-shaped flowers. 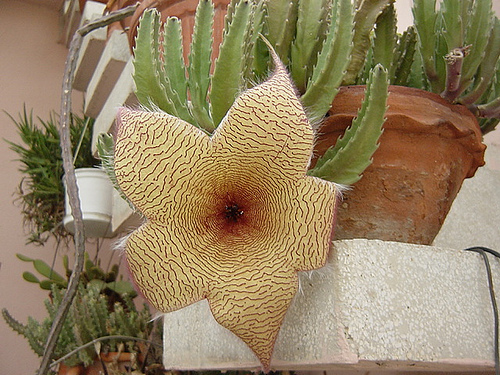 Flowers of certain species like Stapelia Gigantea can grow as big as 41 cm when in full bloom. These hairy and foul-smelling flowers attract insects especially flies that act as pollinators. There are more than 70 species of Stapelia each having different coloration and flowers. 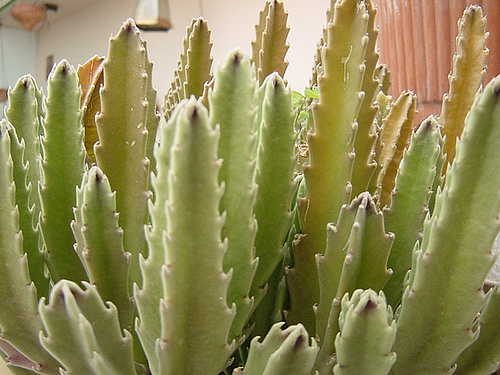 Stapelia are good container plants and can grow well under full sun and light to moderate watering. Plant them in well-drained compost becuase as the stems are prone to rotting if kept moist for long.